The fiery red gloriosa lily showcased in front of the fan of red dogwood will definitely spice up anyone’s day! Not every flower shop carries the glorious Gloriosa flower in NYC. Furthermore, it’s very special and goes by many names. These include fire lily, flame lily, and glory lily due to its bright red color. The flower is native to Asia and Africa and cultivated all over the world. In addition, the red dogwood tree is also unusual. This is because every part of the tree is red. The bark is a deep red and the leaves are a red-purple color. In spring, the blooms are red. And in autumn the tree is adorned with glossy-red fruits. Using delicately aligned pieces of the thin branches makes the perfect backdrop for the fire lilies to shine. The combination of these two elements in this elegant floral design produces a spectacular result. For wedding flowers NYC event planners use, this flower is very special. They should add it to their list if they want to buy flower styles that are unique and gorgeous. 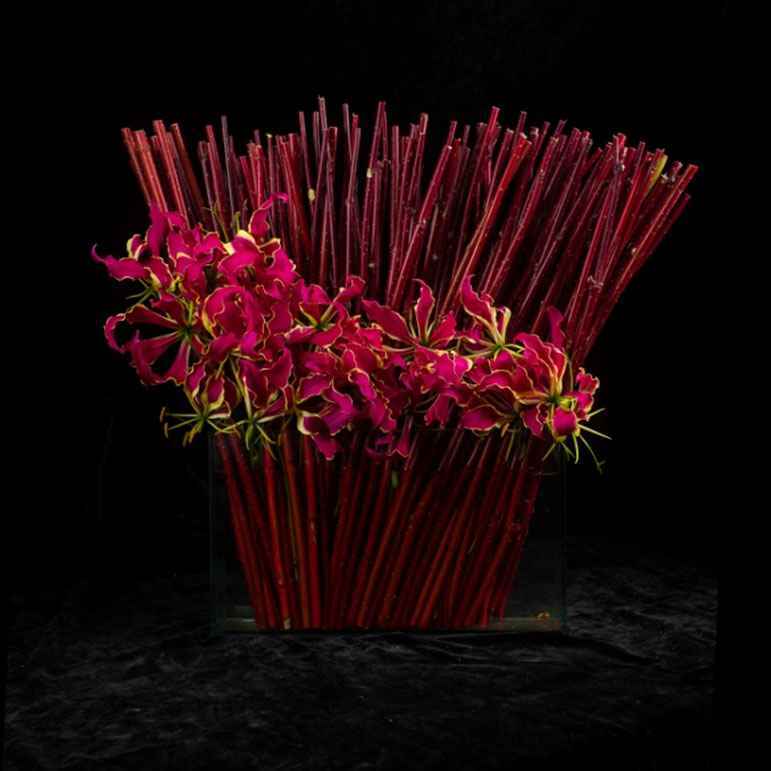 The Gloriosa is a superb addition as a floral arrangement. People use it as a centrepiece for a variety of occasions. These include at dining tables at a wedding reception, corporate celebration, sweet sixteen parties and bar mitzvahs. Bright red is the color chosen for good luck on Chinese New Year. A local reviewer said, “When I want to buy flowers NYC residents will appreciate, this is the best flower shop near me NYC has to offer. I use them for wedding flowers and other celebrations. They have the best flower delivery services.” Make your next event memorable by ordering our Glorious Gloriosa flowers in NYC today!